A founding member of OPDAG (Original Paper Doll Artists Guild), Judy started the OPDAG Newsletter (now called Paper Doll Studio) in 1984. She was chosen because she was the only one in the group who had a typewriter and copier! Since then she has illustrated a multitude of paper doll books for B. Shackman, Dover Publishing, the MagiCloth Company and Schylling Toys. Her paper dolls have appeared in numerous magazines and as convention souvenirs. Her creative talent combined with her ability to take on the style of other artists, has given her the opportunity to illustrate paper dolls of many licensed characters for the MagiCloth Company including Curious George; Arthur and DW; Wishbone; Rugrats; Mr. Potato Head; and Sesame Street's Elmo, Kermit, Miss Piggy, Big Bird, Ernie and Burt. With a strong link to the doll community, Judy has illustrated paper doll versions of several dolls including Mel Odom's Gene Doll, Effanbee's Patsy, Kathe Kruse doll designs, the Magic Attic Dolls, and the Vogue Doll Company's Ginny doll. Many classic characters have been turned into paper dolls by Judy's skillful hand including Dolly Dingle, Billy Bumps, Cutie Doll (Kewpie), Alice in Wonderland, Raggedy Ann and Andy, Brenda Starr and Betsy McCall. In the 1990s, Judy illustrated over 20 cute animal paper dolls for Dover Publishing's Little Activity series including Barnaby Bunny, Effie Elephant, Georgie Giraffe and Robbie Raccoon. For B. Shackman Company in the 1980s, Judy covered a variety of subjects such as animals, children and vintage fashions for paper dolls, stickers an cards. Among the paper doll books were Sisters, Edie Ann, Masquerade, Deva of the Universe her Showgirl series, and the Kitty Cucumber and Her Friends series. Today Judy enjoys restoring vintage paper dolls and selling them through her mail order and website business. 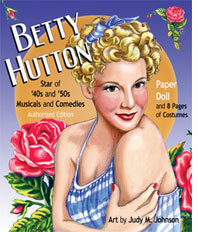 The Betty Hutton Paper Doll is Judy's first published celebrity paper doll. As a big fan of Betty Hutton's movies and music, it was a special honor to commemorate the dynamic actress as a glamorous paper doll. Like Betty Hutton, Judy is a native of Michigan and currently resides in the small town of Skandia in Michigan’s beautiful Upper Peninsula. In addition to preserving the tradition of paper dolls, Judy and her husband, Glenn, are involved in preserving the history of Michigan copper country through local archaeological groups.